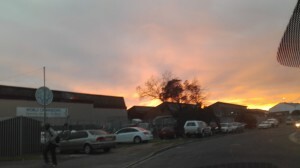 Sometime last week while driving to work I caught a glimpse of the morning sky, which looked like it was on fire. Maybe it’s particularly this time of year because it wasn’t the only morning where the sun was setting the morning clouds aflame. For those who have never read Scripture or been exposed to the Good News, merely looking up at the sky on any given day provides a glimpse of the Artist behind the view. The fact that it’s vast and stretches as far as the eye can see in all directions, and is held in place by gravity so that everything doesn’t spin off out into space…well, that says to me that when God makes something, it works. The system that we call the atmosphere, the sky, hasn’t malfunctioned since the dawn of creation. That’s a 100% record. There’s so much more to what we can deduce about God from studying the sky, but as the infomercials intone, ‘that’s not all’. The sky is awesome and revealing but Scripture takes it many steps further. He tells us his Name, but as the infomercials continue, ‘that’s not all’. God shows us what He has done (sky/the heavens). Then He tells us His Name and gives us commands (Scripture). Then He becomes flesh and shows us He is our father (Christ). We come to the incarnation: God assuming flesh and living on earth. And He reveals to us that He is our heavenly Father. To the Jews living in the 1st Century this was frankly unthinkable. But it turns out to be true.